Whether they are connoisseurs or dabblers, those in search of old music performed live on stage with its original instruments have found that an annual, home-grown event lifts the “June-gloom” from California’s southern coast. 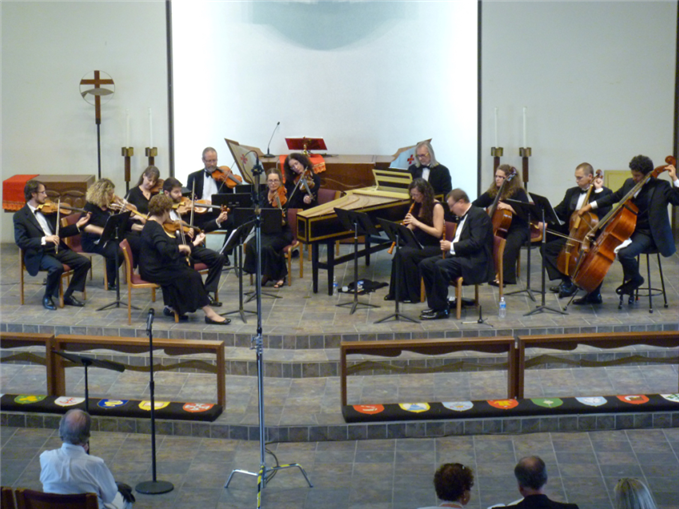 The 35th Baroque Music Festival, Corona del Mar, running from Sunday, June 21st to Sunday, June 28th, continued its legacy of superior presentations in period style by this year offering a Bach-fest. That is to say, treasured favorites of Johann Sebastian Bach became the centerpiece of the series, but not without the orchestra’s shaking the dust off of masterworks we seldom hear, such as his church cantatas Nos. 17 and 73, and not without flanking him with his contemporaries — for both fun and contrast — the Graun brothers of Germany. Mid-fest, this year’s thoughtfully designed repertory featured J.S. 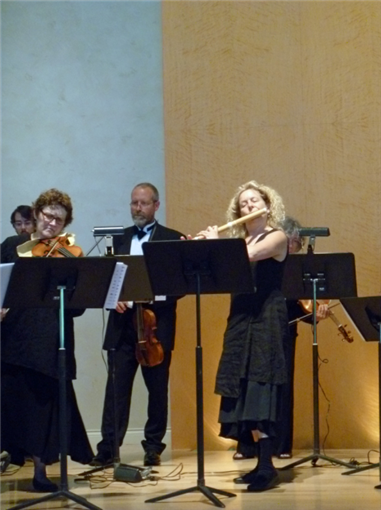 Bach’s exemplary opus in Western classical counterpoint, his Musikalische Opfer (Musical Offering). Wafting their way from St. Mark Presbyterian Church (for opening and closing events on Sundays), to Saint Michael and All Angels Episcopal Church on Monday, and then to the Sherman Library and Gardens on Wednesday and Friday, the concerts filled the air with trills and vibratos of period instruments such as the recorder, all but abandoned in music history despite its mellow, softly rich sounds. 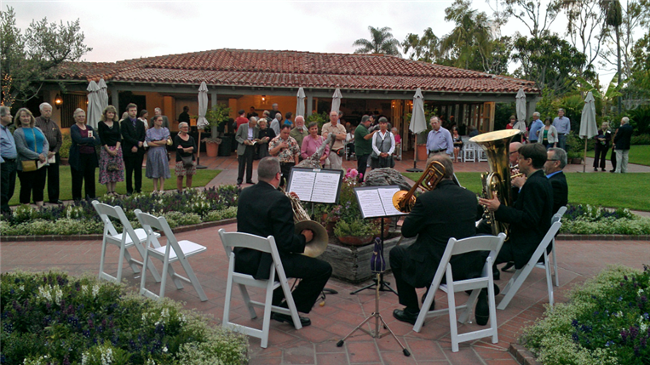 While all venues, ribboning the coastal bluffs of Newport Beach and the lush hillsides of Corona del Mar, received guests with brass ensembles performing al fresco and housed post-concert wine and waters receptions, the Sherman Library and Gardens made for a particularly lovely setting, semi-open-air for the concert itself and under-the-stars for intermission coffee and cookies beside fountains and botanicals. Undeniably, the Baroque Music Festival owes its aesthetic and educational merit to concertmaster and first violin Elizabeth Blumenstock, now in her fifth year as Artistic Director, leader of the festival orchestra, and author of the written program notes. These carefully researched, beguiling annotations are no small matter — the refreshing surprise is that they are an entire booklet of highly informative and pleasurably readable commentaries on the historical contexts, the musical demands of the composers, their solid contributions to and clever departures from the conventions of the times — and even from the mandates exacted upon them by their patrons. King Frederick II (The Great) of Prussia, for whom both J.S. Bach and C.H. Graun composed, and who employed C.P.E. Bach to accompany him on the harpsichord, was a case in point. The king had a new Silbermann fortepiano (since then, called a pianoforte, or “piano”), and a dark theme pervades most of Das Musikalische Opfer, BMW 1079, with falling lines and a peculiar length. The work begins with a Ricercar a 3 for solo harpsichord. 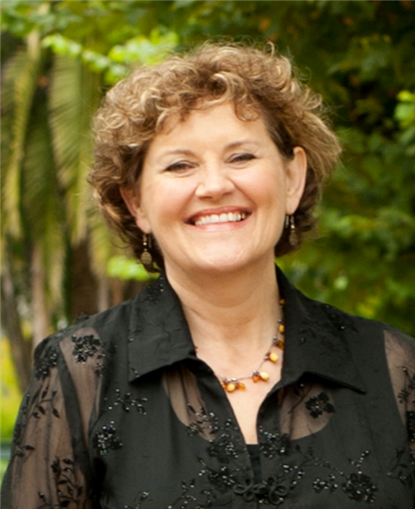 Elizabeth Blumenstock, who was a church organist for 21 years, interspersed her performance with commentary to the audience: “That solo is difficult — erudite, clever, challenging, witty, playful, with peculiar changes in mood and dynamic, and the rests in the style of Bach’s son used to compose. Did C.P.E. Bach have a hand in the King’s dark ditty?” She proceeded with what could be called a sonically illustrated lecture, complete with visual aids, the sheet music for each of us to hold and examine. In Das Musikalische Opfer the canons follow, rounds between violins, but played with two separate voices instead of in unison. Bach experiments here, with counter-themes as mirror images and with reversals of the order of voices. Three parts are implicit in the score, though only two are spelled out, and one form of the three must be two times as slow as is written. These canons really were puzzles, and there is more than one solution for how to perform each canon. The sixth is highly ornamental. Only the cello plays the royal theme. Then comes the Trio Sonata for flute, violin, violoncello, and harpsichord — dark, deep, and dense. The lifts, rests, and odd dynamics of the third movement, the Andante, are tipping the hat to Bach’s son, Carl Philipp Emanuel, who generally went his own way from his father’s style of composing. The balance of the evening’s program presented Concert Royale No. 1 in G. Major by François Couperin for King Louis XIV, Lamento Ferdinand III by Johann Heinrich Schmelzer for the benevolent king who also composed, and Allegro from the concerto for flute, QV 5:173 by Johann Joachim Quantz before returning to and concluding with Johann Sebastian Bach’s Ricercar a 6 from his Musical Offering. It needs to be said that given her extraordinary delivery as 1st violin and Leader of the Orchestra, her Artistic Directorship of the repertory, and her lucid and compelling Program Notes, the Baroque Music Festival without Elizabeth Blumenstock might be an exceedingly different experience. Congratulations to an ambitious, enterprising, and eloquent festival!